- Text reads: "Madness takes its toll. Please have exact change". You'll have other drivers laughing and nodding their heads in agreement with this funny bumper sticker. Because let's face it… insanity can certainly take a toll on your mental health. 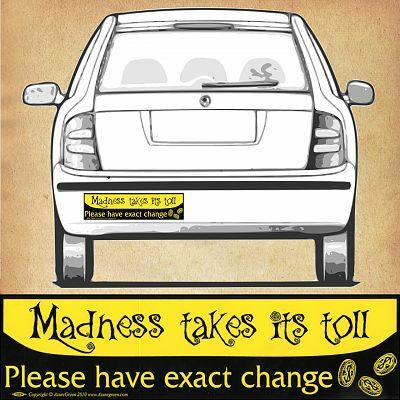 "Madness Takes Its Toll…" bumper sticker measures 11 1/2" by 3". This high quality vinyl decal is resistant to UV and water, and is made to last. Do you have any other questions about our "Madness Takes Its Toll…" Bumper Sticker?